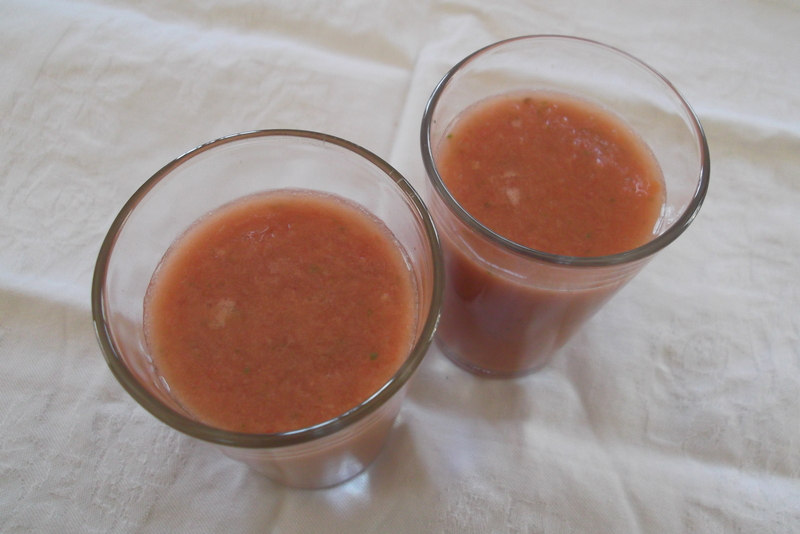 In Andalucia we don´t eat tomatoes...we drink them! So, now we come to the Gazpacho most people are familiar with – the iced tomato and vegetable soup famed the world over (well, almost!). It is served both as a soup here and as a drink. In most homes it comes in a glass. In fact there is a wonderful advert for my favourite Spanish beer, Cruzcampo, which celebrates all things Andalúz. One line in the voice over says something along the lines of “In Andalucía we don´t eat tomatoes, we drink them!” (If you have time to watch it, it´s worth it, even if you don´t understand Spanish, just to see a few snippets of summer life in Andalucía). Every housewife will give you a slightly different recipe, adding her own little tweaks (more of this, less of that). Some use stale bread, some don´t. I tend not to unless I want to serve it a little thicker as a soup which can then be garnished with little chopped cubes of the same vegetables that go into it. So, without further ado, here´s how I make mine. 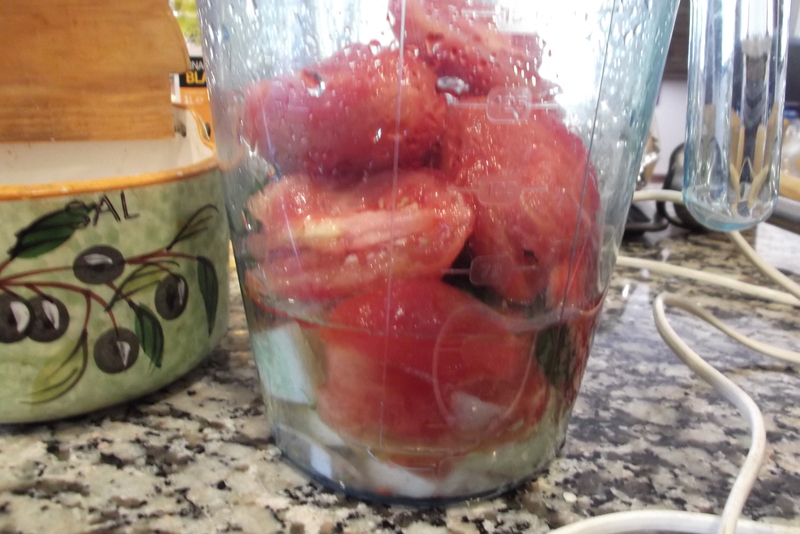 Peeled Tomatoes, Green Pepper, Red Pepper, Onion (optional) Peeled Cucumber, Salt, Water, Olive Oil, White Wine Vinegar. It´s difficult to give quantities. If my tomatoes are lovely and red, I use less red pepper. Sometimes I don´t use onion. But the green pepper and the cucumber do give it that distinctive fresh taste, so try not to leave them out. Today I used 4 large plum tomatoes, one thin green pepper, a small amount of red pepper and a small chunk of onion and half a small peeled Spanish cucumber. Put all the vegetables into a jug or the food processor. Start with one level teaspoon of salt, 3 tablespoons of vinegar, 1 tablespoon of olive oil and about half a litre of water. Now it´s time to start blending. Add more seasoning, vinegar and water as you go along if you want to. Today I added another tablespoon of vinegar (you remember they like it “alegre” or lively here right?!) and about another 250ml of water to thin it a little. Then chill until you need it. If you have put onion in it´s fine on the day you made it but I find it starts to “ferment” a little if you have any left over. Also, while standing in the fridge it may start to separate a little with the water at the bottom and the vegetables on top – just give it a stir before serving and it will be fine. Now, go and put on a straw hat, a paso doble on the cd and lie back in a shady spot and sip on your ice cold Gazpacho. Or ga-pacho, as they tend to say here! These Andaluces and their habit of dropping the “s” sound….most confusing! I love gazpacho and enjoy finding so many different versions! That is very interesting that it is mostly served in glasses as a drink. That sounds like a lovely idea for a brunch! ..and if we add a sneaky shot of vodka and worcestershire sauce well….I won´t tell if you don´t!! A perfect summer recipe! I’ll be making this very soon as we have all the vegetables in the garden now. I’ve just checked the recipe I put on my Food from the Mediterranean blog a couple of years ago and it’s very similar to yours except that I do use breadcrumbs. I think I’ll try it without and serve it in glasses when it gets really hot! It is so refreshing and when you have all the ingredients in the garden there´s no excuse not to make it! 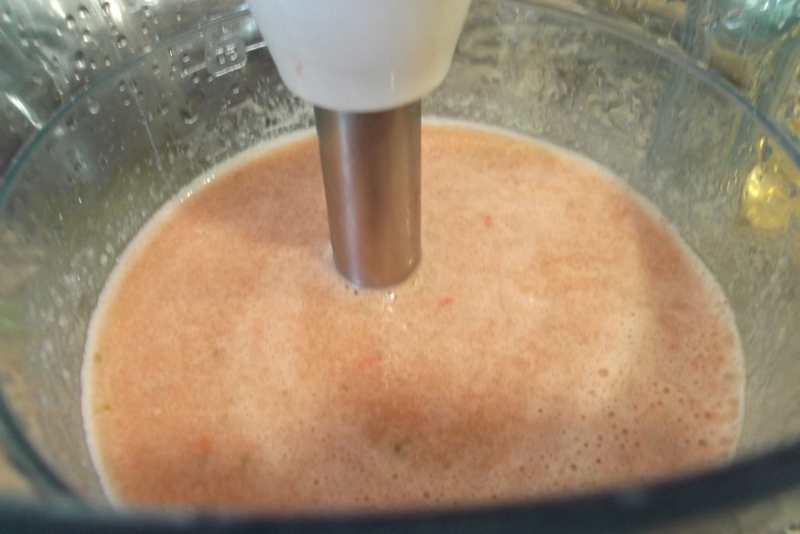 You’re a mindreader, I was thinking about making some gazpacho as a drink – this recipe is yummy! Go for it … you´ve seen me make it, it´s sooo easy! I suppose it is like a chunky veggie juice…all those vitamins in a glass! I swear to goodness I was on your site looking for this yesterday. I know you have two or three other ones. We’re having this tonight. My wife has asked that I keep the cucumbers out. We have so many tomatoes now! Anyway, this is just making me even hungrier for dinner! I feel all chuffed that you were looking up one of my recipes 🙂 that´s made my day! Leave the cucumber out then, put in loads of tomatoes and maybe a few croutons as a garnish….?! Enjoy dinner tonight. Thanks for the recipe!!! I have tottaly forgotten this delicious summer soup!!! 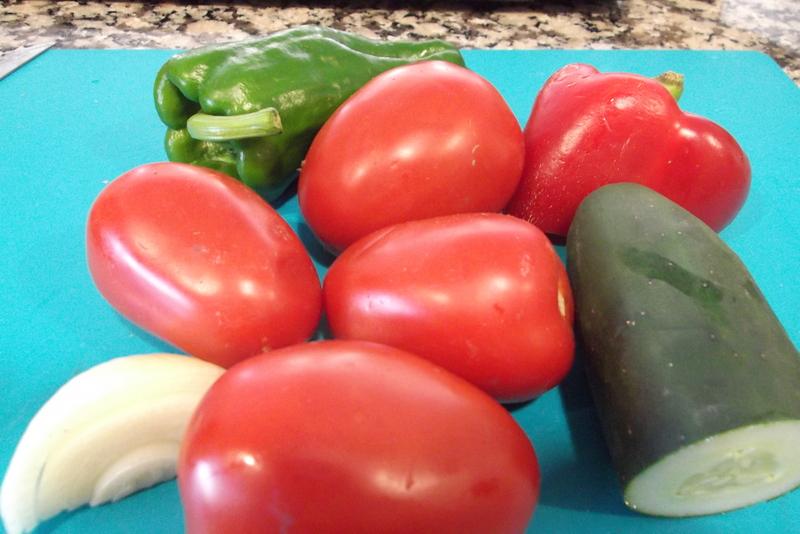 I am also making gazpacho!! 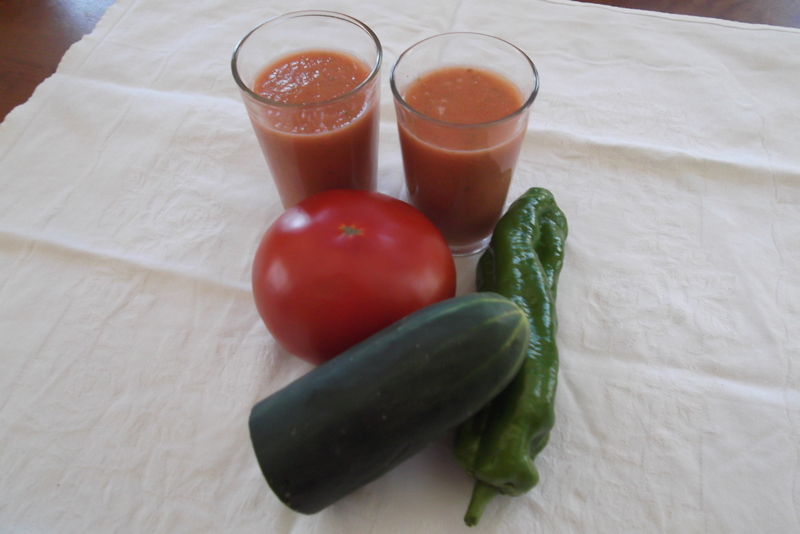 I remember a friend of mine from Spain making some at her house and filling whole bottles of water with gazpacho! She used to keep these during summer in the refrigarator!! And thanks for the add link !!! I loved it!! Andalusians seem very passionate people!!!! One of my favourites! I just have to wait for my tomatoes to grow… Sometimes people make it with lots and lots of garlic – which can be too overpowering. Your recipe looks great and I can’t wait to try! I never use garlic in this version (although, as you say, some people do), I just think it´s fresher without. We drank a litre of it today at lunchtime! I’ve only made this once. It was very nice and I do love it, but the cucumbers tend to disagree with my husband, even if they’re peeled and de-seeded. I suppose I could make it just for me though..
Ok, I´ll let you off the cucumbers! Just put lots and lots of juicy riple tomatoes….enjoy! It´s so easy. Before I lived here I thought it was something super complicated to make, now I whizz up a batch most days in summer. Oh dear – not one for you then! A few years ago I was in your part of the world, specifically in Antequera, and loved their “porra”. Its pretty much your gazpacho but with bread as a thickener… Fresh and cold after a day hiking in the mountain… oh mmmmm! Thanks for reminding me – I’m gonna make some! Yes, Porra (or salmorejo) is my favourite Gazpacho – and you really were pnly about 45 minutes away from me! Here´s my version enjoy! Oh yes, now you´ve reminded me of Panzanella – the Italian bread and tomato salad! And yes, dreaming is always good because somtiems dreams do come true…mine did! I love gazpacho in the summer time but have only had it as a soup. When we lived in Santo Domingo, I used to walk to the Zona Colonial for lunch each day. Gazpacho just seemed to cool you down from the inside out. I’m definitely going to try this version. Tanya, you won’t believe it but I’ve never tried gazpacho. Your recipe is just what one needs for a hot summer day! Well, I had never tried Borscht (hope I spelled it correctly) until a friend from Moscow made it for me! Hope you get to try it one day and enjoy it. I love gaspacho….we lived 3 months in Marbella and I fall in love with spanish food.Very nice blog. Glad you liked the post and the blog! Thanks for the visit and good luck with your blog. Oh wow, Chica – I can’t wait for warm weather to roll around so I can try this!! It sounds so delicious, my mouth is watering…. I want to ask, if we drink juice that inserted ice what makes it so healthy body ..? I want to ask, if we drink juice that inserted ice what makes it so healthy body ..?..